When your kids hit their tween years, they need mothering more than ever. My kids range in age from 9 months to 15 years. (There are nine of them.) When they are itty-bitty, it’s common to think of their nutritional needs and articles and information are abundant–from breastfeeding to first foods to first supplements and herbs. As they grow, however, we tend to be slightly less concerned about whether they are hitting all the major food groups. But, in this stage of accelerated growth–known commonly as the tween years–they need attention to their diet just as much as the early years. I have a nine year old currently who is just entering this great stage of life. He woke up one day about a month ago and he was hungry. And he hasn’t been full since. He’s like The Very Hungry Caterpillar in the Eric Carle book. He just eats and eats and eats. And grows. Right now his body is in growth mode. It needs nourishment. And a lot of it. It’s commonly known that carbs provide a quick source of energy. This does not mean, however, that protein and fats do not provide energy. Carbs may be quicker, but proteins and fats are sustained longer. The best of both worlds is to provide unrefined carbs for quick energy, combined with a source of healthy fat so that there is slowed metabolizing of the calories and avoidance of the sugar-crash. Protein plays an important role in cell growth and reparation of damaged cells. Think outside the boneless-skinless-chicken-breast-box. Think of all the nutrients contained in your protein source. If possible opt for grass-fed liver and other organ meats, bone broths, grass-fed dairy (lots of great magnesium and calcium in there!) and properly soaked legumes. Iron is key in building red blood cells. Red blood cell deficiency (also known as anemia) can result in being fatigued, tired, dizzy, and/or jittery. Keep your tween’s iron levels up naturally (without supplementation) by including shellfish, dark leafy greens, organ meats and bone broth in their diet. Those bones are growing! Plus, tweens are active…running, jumping, wrestling, sliding down hills, biking, falling down, bumping into things. You know the drill. Keep their bones strong with the triple threat of nutrients: Cal/Mag/D. These nutrients rely on each other for absorption. So just supplementing one isn’t going to do the job. Use a Cal/Mag liquid that has a 2:1 ratio. Anything else and your body just can’t use what you’re taking it. Don’t forget the vitamin D. Best form of supplementation is fish liver. I personally like cod liver oil. If you live in a cold climate and don’t get a lot of sunshine in the winter months, I would highly recommend a cod liver oil supplement. Childhood obesity is a huge problem in the industrialized world and it’s only getting worse. Our kids are less active and consume more calories than children in less-developed nations. So, a common question is whether or not to let children eat as much as they want. Bear in mind that I am not a nutritionist, dietician or a doctor. I am a mom. A mom of nine very healthy kids who are at very healthy weights. I say: Let. Them. Eat. My tweens (and I currently have three that fit that description, ages 9, 11, and 12) eat a lot. They just do! They get hungry often. I let them eat their fill. If they need to have three bowls of oatmeal, so be it. If they ate breakfast at 8 and are famished by 10, I let them have a snack. But, here’s the thing: no junk food. No fast food. (Read my tips on going Fast Food Free!) If they eat empty calories and get their fill on artificiality, they will certainly need to eat again in 30 minutes, while at the same time feeling more tired and less vigorous. We are looking for well-being–not just full stomachs. I believe that if the body is truly nourished (on real, nutrient dense food) it will self-regulate. Sometimes that may mean eating more, sometimes less. When properly and regularly nourished (with set meal times and snack times) you can trust your hunger to guide you. 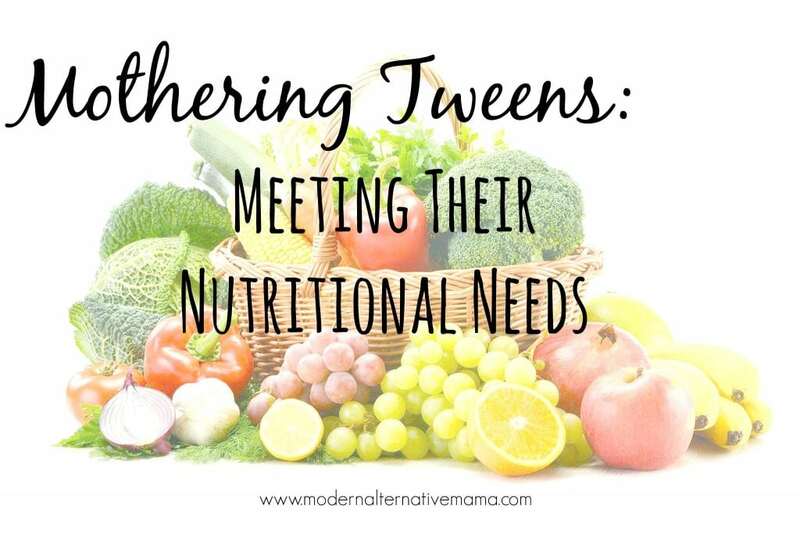 Do you have hungry tweens? How do you nourish their growing bodies? Daja is the happy wife of Gana and the mother of nine amazing children. She's bookish and easily distracted and has too many ideas and not enough time. She writes about family life, preparedness, natural health, liturgical living over at The Provision Room, your source of abundant home-centered living! Will print and put that on my fridge right away. Great post!